Jake Ball. Picture by Mark Fear. Mansfield’s Jake Ball made his England Test debut and took his maiden wicket against Pakistan at Lord’s at the weekend. However, it wasn’t to be a winning debut for the 25-year-old as the tourists completed a 75-run win in an exciting first Test. 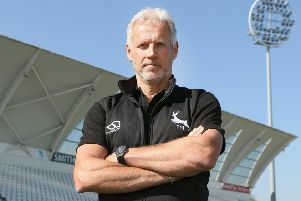 “It was obviously incredible when Alistair (skipper Cook) pulled me to one side and said that I was going to be playing,” said the Nottinghamshire and former Welbeck CC paceman. “I managed to get my head around it and actually managed to get a reasonable night’s sleep. “I just wanted to go out and enjoy it and take everything in. “Everyone that texted me or rang me up said just go out and enjoy it and be yourself – so that’s what I tried to do, and hopefully I have done that. “Obviously to clip the leg stump and get that first wicket was incredible. Another lovely moment at Lord’s came when Ball was handed his cap by his uncle, Bruce French, who claimed almost 1,000 dismissals in the first-class game, won 16 Test caps himself and is now England’s wicketkeeping coach. “He told me how proud all the family are. He was welling up actually – it was quite an emotional moment,” said Ball. The youngster claimed his first Test victim, catching Azhar Ali lbw, to leave the tourists on 77-3 in the first innings, eventually finishing with figures of 19-5-51-1. A wicket proved elusive in the second innings, but Ball ended with decent figures of 16-7-37-0. Chasing 283 to win on the fourth day, Cook’s side were undone by some inspired bowling as spinner Yasir Shah again ripped through England’s line-up to finish with 10 wickets in the match. Victory was sealed by Mohammad Amir, back in Test cricket after serving a ban for spot-fixing during Pakistan’s tour of England in 2010, as he wrecked Ball’s stumps. Jimmy Anderson and Ben Stokes played against each other for their counties at the weekend, as they continue their return from injury, but Ball will be hoping he can retain his place when the second Test begins at Old Trafford on Friday.